KATHMANDU, March 21: Trade and Export Promotion Center (TEPC) has said that Nepali traders are indulging in under-invoicing at customs points while exporting hand-knotted carpet to China, raising suspicion of money laundering and tax evasion by the carpet industry. According to the TEPC, price of hand-knotted carpet stated by traders at customs points is far lower than what they are receiving from buyers through the informal channel. Nepal exported nearly 100,000 square meters of carpet to China in FY2016/17 at an average price of $20 per square meter, while the minimum production cost as calculated by an independent textile engineer of TEPC is $100. If this is figure is something to go by, traders have been undervaluing their exported goods in the invoice by at least $8 million in FY2016/17 alone. Though the government agency has estimated production cost at $100 per square meter, carper producers say the cost can go as high as $150. "While analyzing the export trend, we found a huge discrepancy in the production cost of carpet and the value that exporters put on the invoice," Sarad Bickram Rana, executive director of TEPC, said. "This is a serious case and the problem of under-invoicing in export could extend beyond carpet. However, we are not an investigating agency to look into the case," he added. The under-invoicing of over a billion rupees on export of the carpet is also a loss of income tax revenue for the government. Exporters have been receiving payment that is not accounted for in the invoice from Chinese buyers through informal channels like Hundi and the foreign currency toward Chinese side is used for financing of other imported goods which are again under-invoiced, according to TEPC officials. Invoicing of carpet at customs points is $500-600 per meter in other countries, according to Rana. Hand-knotted carpet is among the top 10 exportable commodities of Nepal. "For many exporters, trade with China still works in a very traditional way. 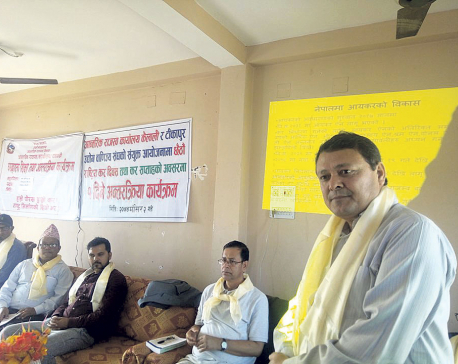 Chinese buyers come and choose product and their order is delivered, while payment is received informally," Hari Bahadur Thakuri, senior vice president of Central Carpet Industries Association (CCIA), told Republica. "However, our association is working to promote transactions through banks. Yet, there are problems to open letter of credit (LC) as a payment channel which is something that the government should facilitate," he added. Some exporters say that they are compelled to the under-invoice carpet at the customs point at the behest of Chinese importers who say that high import cost means high customs duty on their part as well. According to experts, under-invoicing of exports or imports of any product is one of the major reasons why the real figure in the trade data does not come.